On February 9, 2013, we have fine weather in Tokyo. I have to take pictures of T3 before it departs to Denver. T3 equipped with a cross mahogany aero wheel. It is emitting a powerful aura. Dracula will not be able to approach. Please watch T3 from eight angles. All technologies of Sueshiro were poured. The aero spokes seem to offer very smooth riding comfort compared with that of metallic spokes. 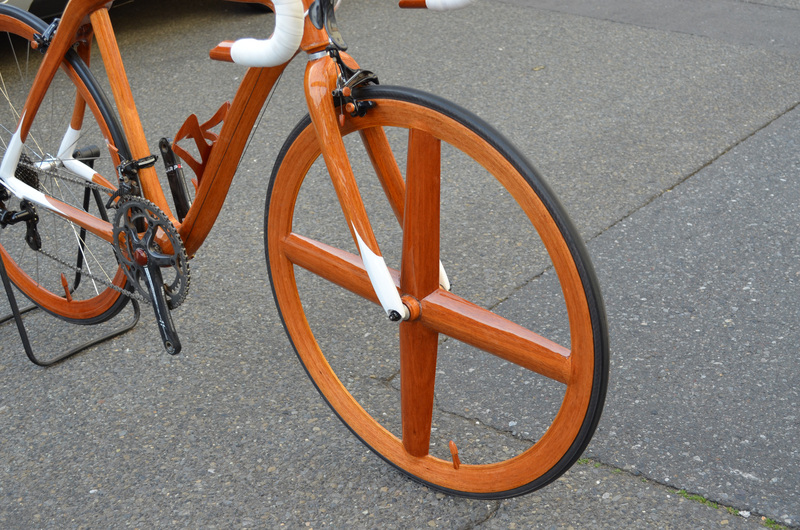 The cross spokes can be installed because mahogany rims have a high strength. The wall thickness of the mahogany spokes is only 2.5 mm. The wall of 2.5 mm consists of laminated five mahogany thin plates. When the mahogany spoke is shed by a finger, it sounds very high. Mr. Chomei is seriously worried that "it may be doubted as being made of a carbon composite". Of course, it is made of a real mahogany. When riding on T3, the cross mahogany spokes make misty low sounds by echoing inside the hollow spokes. Only riders of T3 can listen the whisper of mahogany. I tried to find a position where T3 reflects the sky beautifully. 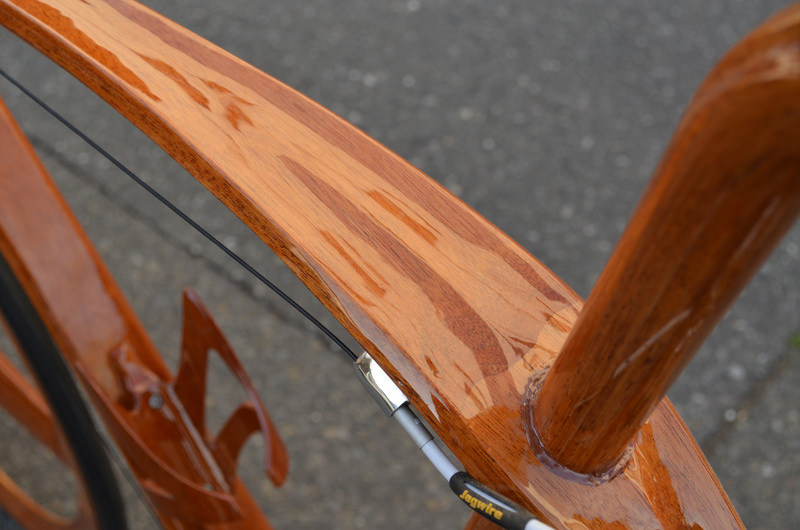 Sueshiro said the weight of mahogany aero wheel is almost same as that of mahogany wheel having metal spokes. Therefore, I think the weight of T3 is in the range of 7 kg. The front periphery was strengthened while maintaining grace. The joint part of the rim and the spoke. It contains mass of knowhow. NSK bearings were fixed directly in a hub made of a laminated mahogany. There is no metal pipe in the hub. It is really mysterious how to produce such a high strength using a wood. The mahogany aero wheel was subjected to test ride by Sueshiro (84 kg), and he found no problem. The mahogany will turn red as it absorbs sun light. A lot of small cavities were formed in the rim for reducing the weight. Carving of "T-3". Mahogany bikes titled "T" are prototypes for testing new technologies. "T"s are not for sale. The rear end of the mahogany saddle impresses us with cheerfulness. The mahogany saddle reflects sky. The sky draws an abstract picture on the curved surface of top tube. Mahogany small plugs were attached to cover holes of brakes. Mahogany plugs in the rear brake. The plugs improved appearance of the brakes. The rear side of the head tube looks artistic. Sueshiro is almost satisfied with the degree of perfection of T3. T3 will be exhibited from May to September in the Karuizawa New Art Museum. A miniature piano and mahogany speakers will also be exhibited under a title of "SANOMAGIC exhibition". The mahogany speakers may make sound in the museum hall. The latest work of Mr. K, the owner of mini wheel bike MWR-2. The light was completely covered with mahogany. Mr. K is truly dexterous. New audio system of SANOMAGIC has not completed, but it can make sound. The thin device at the center is 1-bit DSD recorder, and it is new audio source of this system. All devices are powered by a red medical power supply, and connected to a large earth plate. SANOMAGIC gradually changes into Akihabara due to the activity of the audio instructor, Mr. Sato. Future is a child of chaos. Sueshiro and Mr. Sato will carry some mahogany speakers to a listening room of an famous audio company to receive professional tests. They are ready and willing. Let's listen to the sound.